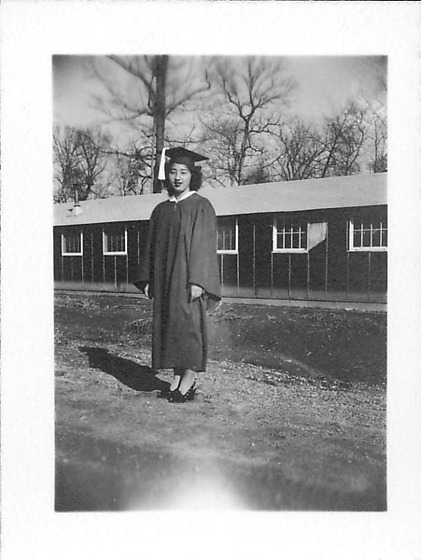 Young woman stands in graduation motorboard and gown and high heels in open area in front of tar paper barracks at Rohwer concentration camp, Rohwer, Arkansas, June 7, 1945. Turned slightly to the left, she stands with her arms at her sides and smiles at the viewer. 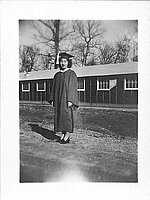 Her gown is ankle-length with a white collar; white tassel hangs on the proper right of her cap. She has short curly hair. The barracks has white window frames and roof. Bare trees in background. Blurred at top; white smudge, BC. Stamped on back, BR: Jun 7 1945.